The Sete Citades caldera volcano on the island of Sao Miguel. The fumeroles at Furnas inside the Furnas caldera. A diagram of the Algar do Carvão volcanic pit on Teciera Island. Entering the pit is literally exploring the inside of a volcano and using the staircases it is possible to decend all the way to the lake. 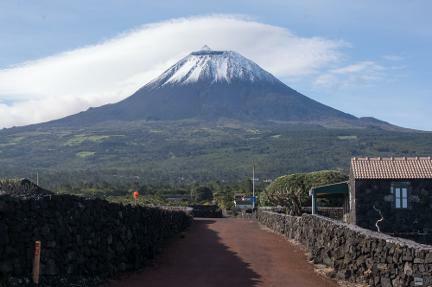 The 'Landscape of the Pico Island Vineyard Culture' World Heritage Site, with a snow topped Pico volcano in the background. 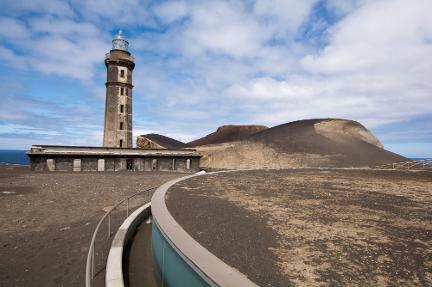 The lighthouse at Capelo, Vulcão dos Capelinhos on Faial Island which is now isolated from the sea due to the Surtseyian eruptions that increased the size of Faial Island. Day 1 - Arrive in Ponta Delgada, Sao Miguel Island. There are direct flights from Lisbon, Portugal and other European and North American cities. Day 2 - Sao Miguel Island. Sao Miguel is the largest island in the Azores and is known as The Green Island. The island sits on top of the Terceira rift which is part of the European/African plate boundary and has 3 active stratovolcanoes. Our first day on Sao Miguel is focused on the Sete Citades volcano. The first stop is at the Gruta do Carvao lava tube Lagoa do Carvao. We then proceed up Serra Devassa, a volcanic ridge stretching south-east from the main Sete Citades volcano, which has many scoria cones lakes in explosion craters. The next stop is the giant caldera of the Sete Citades volcano. The caldera is 5.3km in diameter and contains pumice cones, tuff rings and domes as well as two large lakes. Our journey then takes us to the far western point of the island to see Ponta Ferraria which is a lava delta that flowed from Sete Citades into the sea. We then return to Ponta Delgada where we spend a second night in the same hotel. Day 3 - Sao Miguel Island. 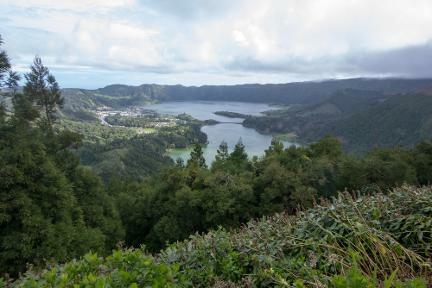 Today we visit the other 2 active stratovolcanoes on Sao Miguel Island: Furnas and Fogo. 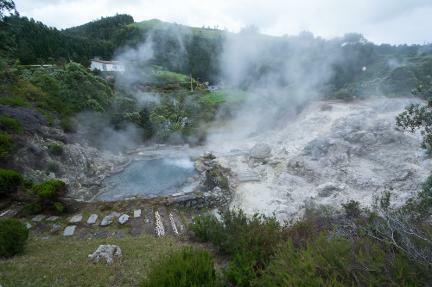 First we drive to Furnas, a silicic polygenetic volcano with a summit calderas complex, which contains a volcanic lake, domes and tuff rings, and a diversified hydrothermal system, with fumaroles, thermal and mineral waters. After the morning in Furnas we continue to Fogo which also has a large caldera. After marvelling at the caldera we visit Caldeira Velha which is an important fumarolic site on the flanks of Fogo. While here we can enjoy a swim in the warm geothermal waters. Day 4 - Terceira Island. Our day begins with an early morning ferry to the island of Terceira. The ferry time is 07:00-12:45, the crossing gives us a chance to spot whales which are common in Azorian waters. 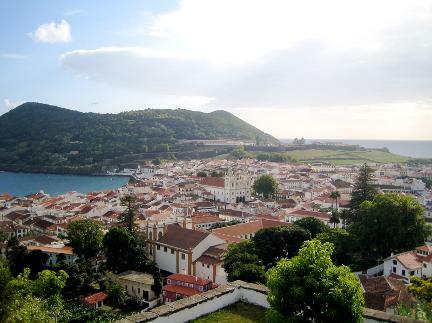 Once on Terceira, we drive to the beautiful city of Angra do Heroísmo, which is a UNESCO World Heritage Site. Here you can either explore the city at your leisure or climb the Monte Brasil surtseyan tuff cone. This volcano formed from submarine basaltic eruptions and is now connected to the mainland of Terceira. The southern flanks of the cone are eroded by the marine erosion and the deposits display several features, like sag bombs, bedding and plant fossils. We spend the night in Angra do Heroísmo. Day 5 - Terciera Island. Our first stop of the day is the Algar do Carvão volcanic pit. This pit is 90m deep and is literally the inside of a volcano! The pit has a peculiar genesis, including both silicic formations and basaltic products dating to 3,200 and 1,730 years ago respectively. We then visit the most important fumarolic field on Terceira Island which is called “Furnas do Enxofre”. We then visit the Gruta do Natal lava tube and we finish the day by visiting the “Santa Bárbara” stratovolcano. The caldera of this volcano is nearly filled by 7 trachytic domes. In the afternoon we take the 16:00 ferry to the island of Pico arriving at 21:30. We will eat on the ferry. Day 6 - Pico Island. Our first stop is the highest point on the island at Pico Mountain Visitor Centre. We then visit the village of St Joao and see the lava flows that narrowly avoided destroying the church. Next we visit Gruta das Torres lava tube which is the longest in the Azores and the 'Landscape of the Pico Island Vineyard Culture' World Heritage Site, where grapes are grown in the lava flows of Pico volcano. In the evening we take a short ferry crossing over to Horta on Faial Island., where we spend the night. Day 7 - Faial Island. We start the day by driving up to the highest point on the island, the caldera of the Faial central stratovolcano. Inside this 2km wide caldera, we see a pyroclastic cone, a dome and a lake. We then proceed via the Capelo peninsula, an 8km long basaltic volcanic ridge created by about 20 Holocene scoria cones and associated lava flows, to Capelo, Vulcão dos Capelinhos e Costado da Nau. This volcano is the geological showpiece of Faial Island and is the western most volcano of the Capelo peninsula. It was formed by 13 months of basaltic eruptions that started as submarine and evolved to terrestrial ones. The volcano joined to the existing island of Faial leaving the once coastal lighthouse now inland! We then return to Horta via Morro do Castelo Branco, a site which is a trachytic dome, mantled by pumice deposits from the Caldeira stratovolcano. The dome is heavily eroded by the sea (e.g. high, steep and plunging sea cliffs) and its uppermost part shows whitish weathered horizons of clay deposits, thus the name “branco” (white). Our final night is spent in Horta. Day 8 - Depart. Today the tour ends. It is possible to fly directly from Horta to Lisbon and then on to the rest of the world or, if you prefer, back to Ponta Delgada on Sao Miguel Island.